Effective strategic thinking requires a clear understanding of one's external environment. Each organization has a unique environment, but as Ross Harrison explains in Strategic Thinking in 3D, any environment—whether in the fields of national security, foreign policy, or business—has three dimensions: systems, opponents, and groups. Unfortunately, due to sales rights restrictions, we cannot offer Strategic Thinking in 3D for sale in your country. Effective strategic thinking requires a clear understanding of one’s external environment. 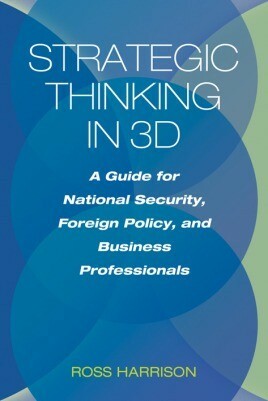 Each organization has a unique environment, but as Ross Harrison explains in Strategic Thinking in 3D, any environment—whether in the fields of national security, foreign policy, or business—has three dimensions: systems, opponents, and groups. Systems strategy involves the challenge of creating leverage against opponents by shaping the external environment they rely on for sustaining their power. Opponents-based strategy requires analyzing a competitor’s capability, motivation and strategy, assessing one’s own competitive challenges, and then developing approaches for directly confronting the opponent. Strategy applied to groups aims at mobilizing political, consumer, and market groups against the power of an opponent. Strategic Thinking in 3D makes strategy “portable” for individuals who switch careers multiple times during their professional lives, moving between public, nonprofit, and private sector jobs. Harrison uses al Qaeda’s strategy against the United States as a “capstone” case study to demonstrate how strategic success often results from the cascading effect of “wins” in all three of these dimensions. Conversely, strategic failure can come from the mutual reinforcement of “losses” across these same three dimensions. Reinforcing and integrating the concepts, Harrison shows how strategy in 3D actually works in practice.